Slowly stir in ½ cup / 120 ml whipping cream. Season with salt, pepper, cayenne and nutmeg. Reduce heat, cook for ca. 30 minutes. Then remove from heat. In a separate pot bring 1 cup / 240ml water to a boil. Add a bit of salt and the frozen spinach. Cook for 4-5 minutes. Drain. Stir spinach into the Béchamel. Add ¼ cup / 60ml of cream. Add egg yolks. Stir well. Whisk egg whites to stiff peaks. 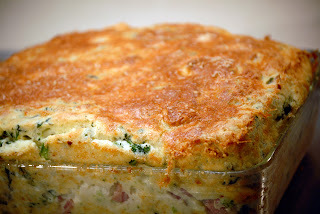 Carefully combine with the spinach-bechamel mixture. Avoid deflating the foam as much as possible. Distribute equally over the ramekins. Bake for ca. 15-20 minutes until the surface starts to brown lightly.